We have all garnered skills, character traits, and pearls of wisdom during our experiences, successes, and challenges in life. We all possess valuable truths inside of us. No matter what our job, background, or social status, our knowledge and truths are important. I believe it is vital to share our truths with others and as essential to listen to them from others. Sharing, teaching, listening, being open-minded, and learning, is how we connect as individuals and how we grow and mature on our journey in life. I had a significant sharing and learning experience earlier this year, during a trip with my spouse through Corporate Alliance. Corporate Alliance is an organization who helps people create and manage successful business relationships. CEOs, COOs, presidents, and owners of companies, and their respective spouses, attended the trip. We had a memorable time, with a valuable service project aspect (which I wrote about here) and some great ‘getting to know you’ activities and opportunities. One could have felt daunted surrounded by the company of such highly successful and driven individuals. Fortunately, however, I did not. This may have been partly because my companions did not look intimidating, the relaxed dress code calling for shorts and t-shirts. The service project aspect of the trip certainly helped too; standing shoulder-to-shoulder, covered in sweat and paint, alongside an individual is a sure way to create a level playing field. It was also due to my philosophy of treating and valuing people equally, no matter who they are or what they do, and thus my motives, or lack thereof, behind my interaction with the other attendees. This brings me to one of the beauties of this trip. One of the key ethos at Corporate Alliance, and one I have always strived to follow, is to avoid relationship arrogance. This is such a powerful and worthwhile concept to me, I want to share it with you. Relationship arrogance is to have ulterior motives in relationship development. It is prioritizing relationships based on a forecasted return on investment, i.e., figuring out whom we perceive to be the most beneficial people to interact with, and pursuing those relationships. Relationship arrogance is to dismiss those who we do not consider worthwhile to us. This can happen in business, but just as easily when interacting with others on a social level too e.g. other parents at your child’s school, adults in clubs/groups, those who serve us at restaurants, sit next to us on public transport, etc. Is judging or preconceiving relationships something you do? To avoid relationship arrogance is to treat everyone with respect and as someone who is important. I believe that when we interact with people they can feel if we have an ulterior motive. It is more real to interact with people on the pure basis of kindness, friendship, and common human decency. It feels good to both parties. In the book City of Influence: A Business Tale, written by Corporate Alliance founders Jared & Sarah Stewart, they share “The way you judge people affects your ability to build a relationship with them, and it’s arrogant to make assumptions before having any meaningful interaction.” If you make your interactions genuine and with good intent, you will be surprised where it takes you. You can often find help and support from the least expected of people. Another important takeaway is developing relationships ‘just because’– also a core value of the Corporate Alliance organization. 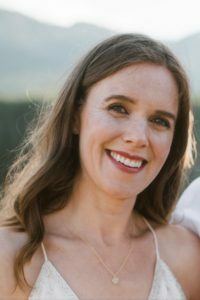 The President of Corporate Alliance’s Salt Lake City hub, Katie Holland, shared a wonderful story with us, which demonstrated relationships ‘just because’. The story is based on author Kent Nerburn’s experience as a cab driver, and a particularly special journey taking an elderly woman to hospice. It is a touching tale and reminds me to be gracious and giving to all whom I come across. Read it here: http://www.huffingtonpost.com/kent-nerburn/cab-ride_b_1474147.html. As the trip progressed, I heard other stories and pieces of advice from my companions that I thought were worth noting. One of these was to be present in the moment. In today’s society, I feel this is ever more important. There are so many distractions, one can be sucked away from real face-to-face interactions, into virtual/electronic worlds (social media, gamming, TV, etc.). We can forget the importance of those around us. Being on the receiving end of this can make you feel invisible and worthless. There have been some great impactful short videos recently to remind us to ‘disconnect to connect’ and ‘look up’ (I urge you to watch them here and here). I remember as a child my mum insisted if we wanted to speak to her that we stop what we were doing, and come to talk to her face-to-face; we were never allowed to shout to her from elsewhere in the house. I am glad she did this, it shows respect, and that we find the other person important. During the Corporate Alliance trip partners working both within and outside of the home, shared with me that they remind themselves of the importance of being present with each other and with their children and loved ones. They leave work at the door or leave chores until later, and fully engage with each other. I personally know it feels so great to be on the receiving end when someone gives you his or her full attention, so this is something I strive to give too. This leads me on to another perspective shared, that multitasking is overrated. Often the ability to get several things done at once is considered a positive trait. Women are said to be better multi-taskers. Parents often rely on it to get everything done that they need to do during the day. However, when multitasking, are we doing everything to the best of our ability? On the trip, one CEO shared with us that he asks potential employees if they are good at multitasking, and if they say “yes,” then they might not find themselves employed by his company. He shared an example of someone who tries to write the alphabet and a sequence of numbers 1-26. If we do this separately, we could do it quickly; however, if we tried doing both tasks and alternating between one letter and one number, it would slow us down considerably. I also read a book recently called Rewired by Camille Preston (which I would highly recommend). In her book, she discusses the downside of multitasking and loss of productivity. I concur personally with her words, that when we start a task and another sidetracks us, the interruptions can cause a significant delay in getting back to being fully productive in the original task. She shares the results of a survey, which shows how multitasking costs the economy billions of dollars a year. Having the diminished performance and loss of focus in multitasking pointed out to me, it has changed my original notion of it being a positive skill. Preston advocates being present in the moment and recommends that we are mindful, that we ‘unitask’, and focus on one thing at a time. The final pearl of wisdom that I want to share is aligning your principles (beliefs) and actions (behavior). A friend I met on the trip shared this concept with me and that you could consider it in a venn diagram (which I love being a Econ/Math major). On the one side you have your beliefs and on the other your behaviors. 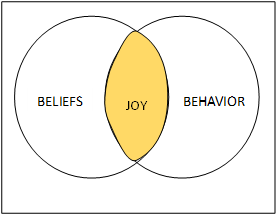 When these overlap and we act according to our principles, then there is unity, we are in balance/compliance and experience joy. However, when our behavior falls outside our beliefs, there is not. I like this concept. It resonates with my heart. I have personally experienced it. I know if I act and behave (in the way I talk to and treat people, the way I approach situations, etc. ), according to my beliefs, then I feel good. I am joyful. If I do something out of line with my principles, then I do not. Do you make sure your behavior aligns with your beliefs? As I reflect on these pearls of wisdom, it reminds me of many things. It reminds me of the importance of relationships, to value them and to approach new ones with an open heart and mind; it reminds me to be mindful, present, and focused on who I am with or what I am doing; and it reminds me to act according to what I believe to be right and true. I am so grateful to have been part of the experience with Corporate Alliance, for the opportunity to learn and grow, to be renewed, fulfilled, excited, and with a new set of people to call friends. I encourage you to fully embrace and be present with relationships and experiences, and face them openly and honestly. Follow your beliefs. Share your truths with others, and be willing to learn from theirs. This entry was posted in Musings and tagged aligning your principles and actions, be present, be present in the moment, beliefs and behavior, C4, Camille Preston, city of Influence, City of Influence: A Business Tale, Corporate Alliance, developing relationships ‘just because’, disconnect to connect, Jared Stewart, judging, Katie Holland, Kent Nerburn, look up, mindful, multitask, pearls of wisdom, preconceiving, principles and actions, prioritizing relationships, relationship arrogance, rewire, Rewired, Sarah Stewart, truths, ulterior motives, unitask, venn diagram on June 24, 2014 by lydiakluge.